Map of Jersey City and Hoboken Hudson County N. J. A map of exceeding rarity. 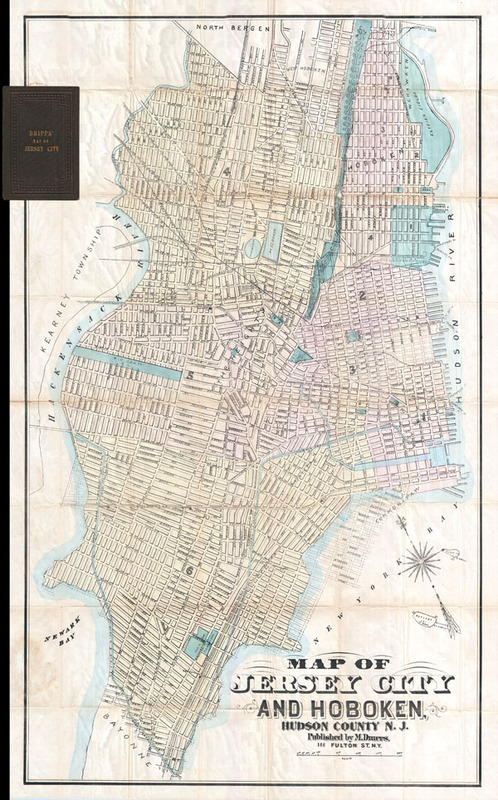 This is the only known example of Matthew Dripps' pocket map of Jersey City and Hoboken. While this map is undated, the combination of the map's attribution, printing style, and the inclusion of certain geographic features such as the Statue of Liberty, firmly date it to 1885 - 1887 period. Covers Jersey City and Hoboken from North Bergen and the Elysian Fields of Weehawken south to Bayonne. Bounded on the west by the Hackensack River and on the east by New York Bay and the Hudson River. Identifies various streets, canals, parks, reservoirs, train lines, tunnels, ferry lines, and important public buildings. We have been unable to locate a single example of this map in any major collection or cartobibliography. Published by Matthew Dripps from his 111 Fulton Street office in New York City. Very good condition. Verso repair and reinforcement on original fold lines. Comes with original linen binder, from which it has been removed for framing purposes. Minor damage and discoloration where originally attached to binder in upper left quadrant.